Does anyone here have one of these or seen this used before? CanuckBob wrote: Does anyone here have one of these or seen this used before? Fascinating. However, I have some reservations about cooking food in a plastic bag, which might release chemicals from the plastic when heated and introduce them into the food. Thoughts? I left my Nomiku brand system NOB as I could not bring it all, but will fetch it before long. The method can and will change the way you think about cooking. Accept what is said about the results as they are real even though the method seems strange and against all you thought you knew about cooking. Beef brisket will become your cut of choice and you will never worry about that raw egg sauce getting you sick. There are many forms of plastic and that used is the same food grade material that is universally accepted as being safe. I noticed they don't ship anywhere in Latin America yet they ship to most other parts of the world. I sent them an e-mail asking why. I am interested in getting one as I'm thinking this might be the one way to get one of these Mexican steaks tender. Also, if you get one coming, be sure to have a food-saver type vacuum unit on order too. While you can live without one, my experience has been poor with breaking bags being the biggest problem. 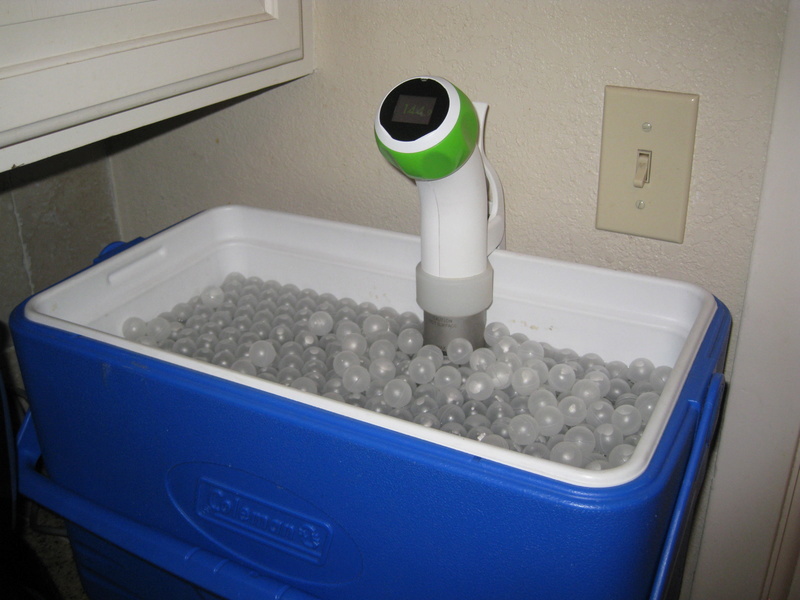 I've sous vide'd using the beer cooler hack. Interesting and fun experiment. One of the advantages to sous vide is "holding" the food and not overcooking at temperature. I've found the best results in cooking rare/medium rare Mexican meats is the reverse sear method. Describing sous-vide cooking to a non-user is like trying to describe an octave to a deaf person. My beer cooler hack with the lid off. The balls are food grade plastic spheres used to minimize evaporation, as a 3 day run of brisket will lose a lot of water. Good discussion and worth bringing back up. I have never tried this form of cooking but have been lucky enough to enjoy the meats of Lunateak's labors on several occasions. Always wonderful! Let us not forget to mention that sous-vide can quickly cook fish to perfection each and every time. What do you think of these complete units? I would not have bought a bath unit because of the higher cost, but that one is a steal. The timer is nothing, but the rack is handy. I say to go for it Bob. Ordered it. It will be here in 10 days. Next time you visit PV go and enjoy a wonderful meal while meeting Bruce at Anjeo Limon - he may even teach you. CanuckBob wrote: Ordered it. It will be here in 10 days. OK, times up. Please post your experiences with sous-vide so far. My friends down the street ordered one last week and we are going to have a pork roast tonight. I have cooked steaks and a pork loin so far. Both were perfection. I seared the steaks after cooking but the pork loin I seared before cooking. The steaks were very tender. I am quite happy with this cooking method. Went to dinner last night and had a pork roast that was cooked with the Sous Vide. It turned out very good. Lots of flavor from the added spices that were in the bag with the roast. The roast was juicy and flavorful. After the roast was removed from the bath it was put on the grill to brown. Grill could have been hotter, but the results were very good. I worked for Taco Bell for 10 years, I saw them go from real food to boil in the bag and the flavor just was not the same. Sous-vide is not "boil in a bag". Bob, don't forget to try some fish. It is quick and exact. Hensley wrote: I worked for Taco Bell for 10 years, I saw them go from real food to boil in the bag and the flavor just was not the same. With Sous Vide cooking the water is no where near boiling. Usually 130f to 138f for most things. Its about slowly bringing the food up to exact eating temperature. Its the only way I will cook a steak anymore. My wife tried our new Sous Vide cooker last night with chicken breast. It was very moist and cooked perfectly. Steaks are next.